China will buy a "very substantial" amount of agricultural, industrial and energy products, the US says. At the summit in Argentina's capital earlier on Saturday, the G20 leaders agreed a joint declaration that notes divisions over trade but does not criticise protectionism. Mr Trump and Mr Xi held a "highly successful meeting", the White House says in a statement. It says the US tariffs on Chinese goods will remain unchanged for 90 days, but warns: "If at the end of this period of time, the parties are unable to reach an agreement, the 10 percent tariffs will be raised to 25 percent." The US says China agreed to "purchase a not yet agreed upon, but very substantial, amount of agricultural, energy, industrial, and other products from the United States to reduce the trade imbalance between our two countries". Both sides also pledged to "immediately begin negotiations on structural changes with respect to forced technology transfer, intellectual property protection, non-tariff barriers, cyber intrusions and cyber theft", the White House says. President Trump said earlier this year he wanted to stop the "unfair transfers of American technology and intellectual property to China". The White House statement said China was "open to approving the previously unapproved Qualcomm-NXP deal". Qualcomm - the world's biggest chipmaker - had abandoned its $44bn bid for Dutch rival NXP Semiconductors after Chinese opposition. The US also says Beijing agreed to designate Fentanyl as a controlled substance. The opioid - much of it thought to be made in China - is driving a huge rise in drug addiction in the US. Chinese Foreign Minister Wang Yi told reporters after the talks that "the principal agreement has effectively prevented further expansion of economic friction between the two countries". He hailed "new space for win-win co-operation", while Chinese state TV said negotiations would continue. What's the background to the trade war? Both sides have imposed tariffs on billions of dollars' worth of goods. The US has hit $250bn of Chinese goods with tariffs since July, and China has retaliated by imposing duties on $110bn of US products. Mr Trump had also said that if talks in Argentina were unsuccessful, he would carry out a threat to hit the remaining $267bn of annual Chinese exports to the US with tariffs of between 10 and 25%. 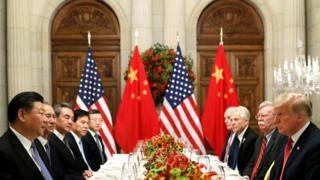 US-China trade divisions meant an Asian economic summit earlier this month was unable to agree a formal leaders' statement for the first time in its history. How did Trump sum up the talks? Returning from the G20 summit on Air Force One, Mr Trump told reporters "it's an incredible deal" that would have an "incredibly positive impact on farming". "What I'd be doing is holding back on tariffs. China will be opening up. China will be getting rid of tariffs," Mr Trump said. China has pretty much given up nothing in this deal because the future tariffs threatened from the Beijing side were retaliatory in nature and only to be applied if the United State escalated. For this it has gained a 90-day reprieve, during which time both sides have pledged to ramp up talks. When China's Foreign Minster Wang Yi spoke to reporters after the meeting he said the two leaders had agreed to open up each other's markets and that this process could lead to the resolution of "legitimate" US concerns. This was either an acknowledgment that Washington does have legitimate concerns or a way of differentiating those American concerns which are reasonable from those which are not actually "legitimate". This is not a suspension of the trade war but a suspension of the escalation of the trade war. Big questions remain about the preparedness of Beijing to allow international access to this enormous market to a level that would satisfy the Trump administration prompting a complete halt in the trade war. On other issues, the US president announced he would be "formally terminating Nafta [the North American Free Trade Agreement] shortly". This would give lawmakers six months, he said, to approve a new trade deal agreed with his Mexican and Canadian counterparts on Friday or revert to trade rules from before 1994, when Nafta took effect. He also said he was likely to meet North Korean Leader Kim Jong-un in January or February and three locations for their second meeting were being considered. Mr Trump added that he would also invite Mr Kim, with whom he has "a good relationship", to the US at some point. What else happened in Buenos Aires? French leader Emmanuel Macron told reporters that the World Trade Organization, the body that regulates trade disputes, needed to be modernised. A senior US official told Reuters that it was the first time that the G20 had recognised that the WTO was "currently falling short of meeting its objectives" and needed reform. On Friday Mr Trump briefly met Russian President Vladimir Putin on the sidelines of the G20, a Russian official told Reuters. Earlier the US president said he had postponed a planned press conference "out of respect for the Bush family", following the death of former President George HW Bush, at the age of 94. Earlier on in the summit, emerging economies denounced protectionism. US-China trade row: What has happened so far? Trade war truce: A win for the US or China?